One of the most important items on our holiday dinner table is a big basket of homemade soft dinner rolls. It just doesn’t seem like the holidays without them. My brothers…and as the family has grown, their sons…usually grab at least two when the basket makes its first round of the table. I have always been amused and gratified by this. There are of course always plenty…but I’m happy that they love something I make so much. When I was growing up, both of my grandmothers served dinner rolls at the holidays. I have no memory of the homemade rolls of my paternal grandmother. I am told she was an amazing cook, but by the time I was old enough to be aware of—or remember—the food at her table, she had turned to convenience fare (instant potatoes, purchased dinner rolls, etc). But I’m sure her homemade rolls were delicious. Apparently my older brother’s mantra at her table was “more rolls, more rolls” (I am told that mine was “more butter, more butter”... I know everyone is shocked). 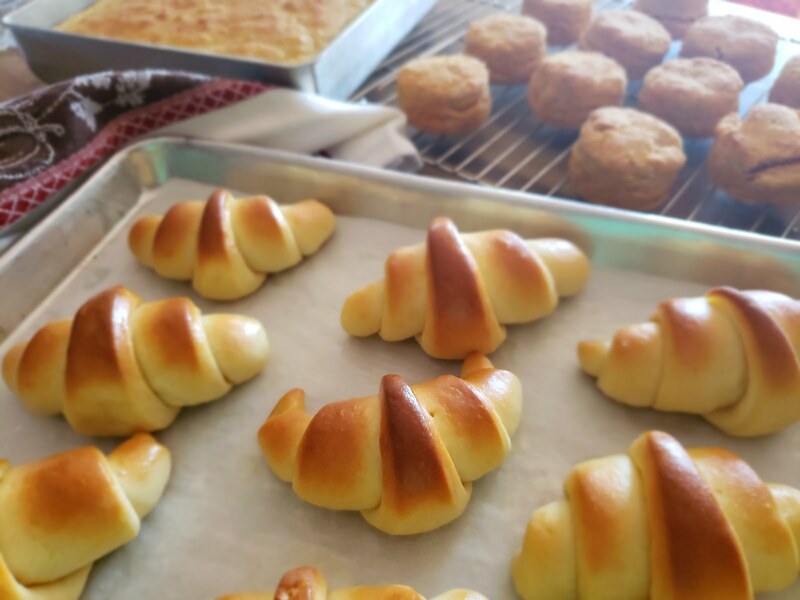 My maternal grandmother's rolls—that she made until she was no longer able to stand up to cook—were the stuff of legends. 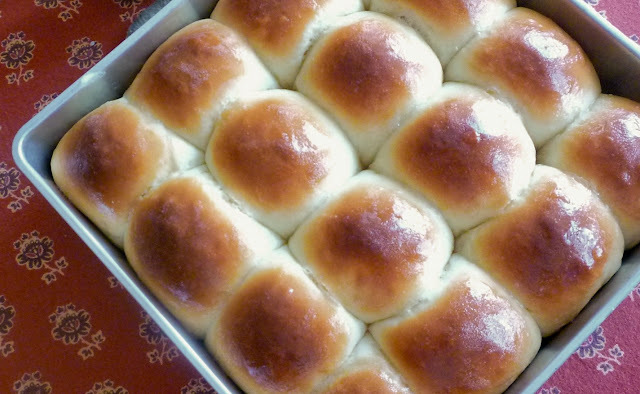 Soft…slightly sweet…buttery….and light… I remember walking into her kitchen—filled with the amazing sights and smells of the holidays—being greeted always by several towel-covered pans of rising rolls sitting on the counter. I would catch a glimpse of the rolls themselves when she pulled back the towels to check their progress. I loved the way they looked—puffy clouds of buttered dough, shimmering in the November or December light coming in through the windows. Sometimes the rolls were in muffin tins—with three little balls each—for cloverleaf rolls. And other times the puffed folds of Parker House rolls appeared when she pulled back the towels. She must have made pan rolls (sometimes called pull-apart rolls) too, but for some reason I can’t conjure up a visual memory of those. When I began to contribute to the holiday table, rolls (and pies) were one of the first things I made. I have made various recipes for rolls over the years—trying out different ones from newly acquired cookbooks…or the latest magazine…in my early days as a cook (young cooks always seem to want to make something new and different). But at some point during the past twenty five years or so since I started cooking professionally, I returned to the recipe that my grandmother made. Because she was a generous cook, there are multiple copies of her roll recipe—in her own hand—floating around the family recipe files. 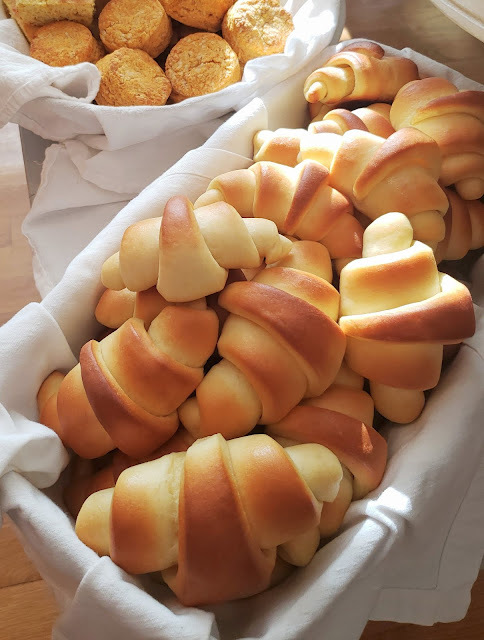 They are all in one of two forms: the original “Jo’s Rich Rolls”…and then in a later, shakier hand, “Jo’s No-Knead Rich Rolls.” The rolls are identical except there is a much smaller quantity of flour in the no-knead version. She claimed to prefer this later version, saying it made much lighter rolls. But I admit I didn’t like them as well. The texture, while very open and porous, was a bit more firm...and not as pleasing to me as the soft, fine-grained texture of the original kneaded version. I think it is possible that she was getting tired…and that the no-knead version was just as delicious without requiring the physical exertion of kneading. If you follow my blog, you might recognize this recipe. 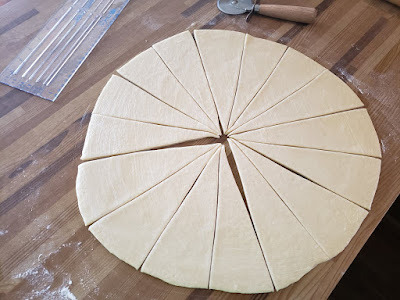 It is a fantastic basic dough that I use for all kinds of preparations. When I make cinnamon rolls, I add a bit of cinnamon and orange zest to the dough, roll it out and fill it with cinnamon and sugar. 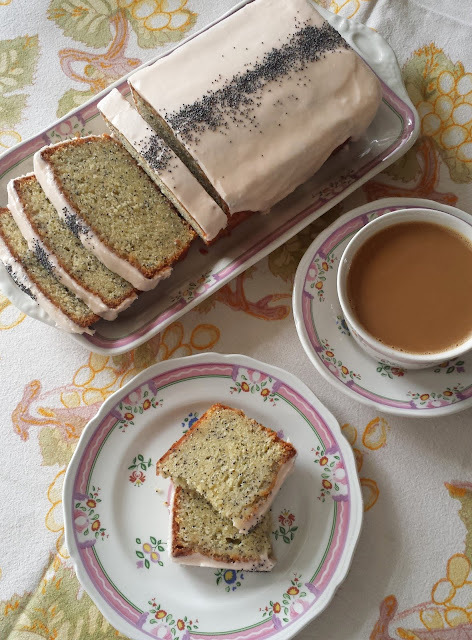 And I have posted two filled breakfast loaves—one, a Christmas wreath, filled with pistachios and dried cranberries…and the other, a twisted braid filled with chocolate and almonds. In both these recipes I add a bit of spice to the dough too. I don’t know if my grandmother ever did any of these things. But it is possible…and I’m certain she would approve. She was a creative and adventurous cook. For some reason I have never made my grandmother’s rolls in their cloverleaf or Parker House form. I usually make pan rolls or crescent rolls. I have never taken a poll, but I think the pan rolls are the ones my family prefers. 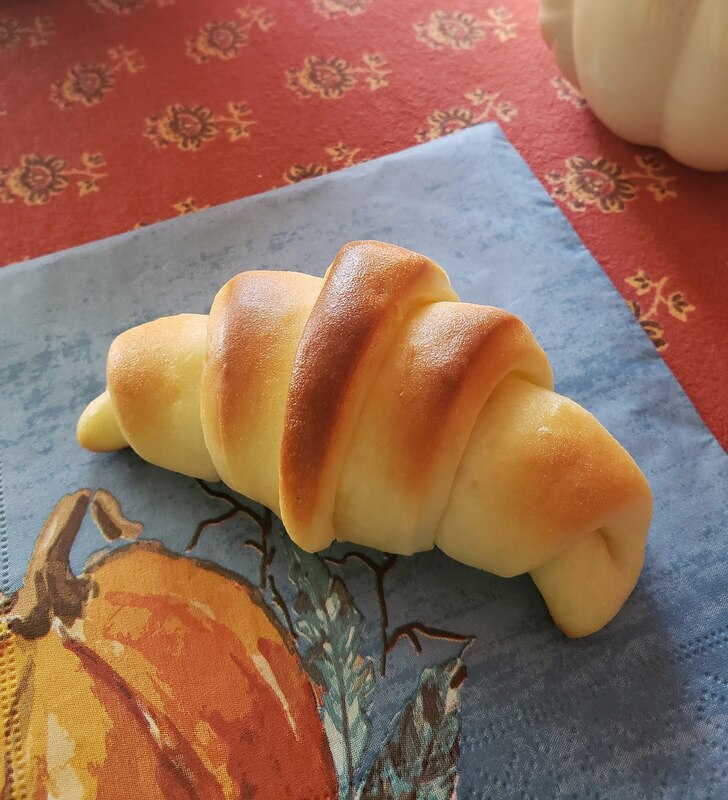 And while the crescent rolls are a show stopper in terms of looks (and seem to hold a special place in the hearts of many), I think I prefer the pan rolls too. From a cooking standpoint, they are more efficient. Using only two 9-inch square pans (that can be stacked, if necessary), they take up much less counter space (which is at a premium at the holidays) while they are proofing. In this form, the baked rolls seem to keep a bit longer, too (and make cute mini slider buns for that roast turkey the next day…). No matter what shape you choose, you can always bake them ahead and freeze them. I don’t think my grandmother ever did this, but I find that when I’m preparing the whole meal that making the rolls ahead makes my life a lot easier. Just bake, cool and wrap well. Pan rolls shouldn’t be pulled apart…just wrap the whole square. Crescents can be packed on sheets and wrapped…or tucked into freezer bags. On the day you will be serving them, let them thaw—still wrapped (this will conserve their moisture)—at room temperature. When ready to heat them, remove the plastic and wrap them in foil. To heat, place them in a 350° to 375° oven for 10 or 15 minutes—about the length of time it takes you to carve the roast and put the sides into serving dishes. This year my only job for Thanksgiving dinner was to make bread. 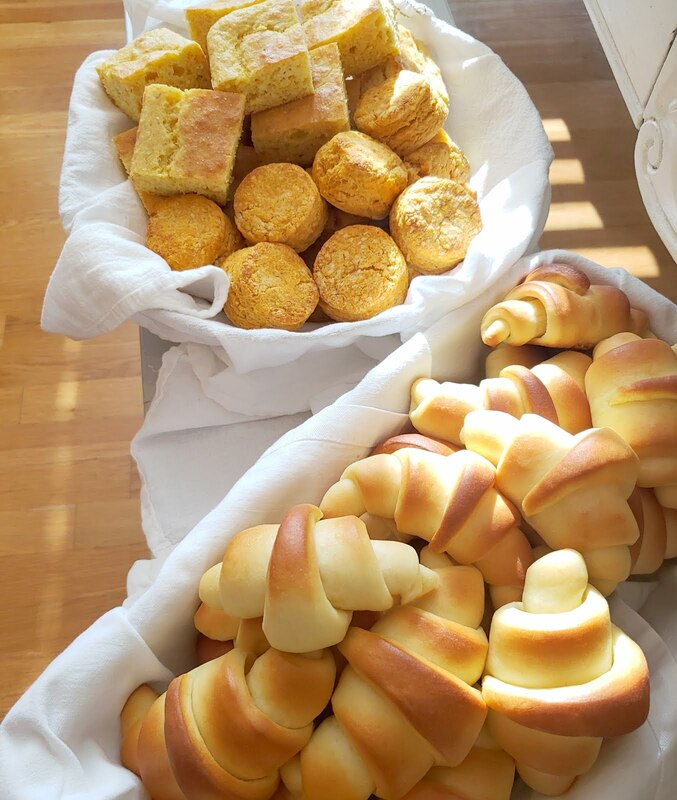 So I made my rolls the day of the feast….and made some cornbread and sweet potato biscuits too. I have always thought these two quick breads would be just the thing on a Thanksgiving table…alongside a basket of yeast rolls of course. So I would have a nice variety of shapes, I decided to make the rolls crescent shaped. I was so glad I did—I thought they were beautiful together. I am including instructions for both the pan rolls and the crescent rolls. I haven’t looked at my grandmother’s recipe cards in a while, but I’m pretty sure there aren’t any specific instructions for forming the rolls (she would have said something like “form the rolls into the desired shapes”). 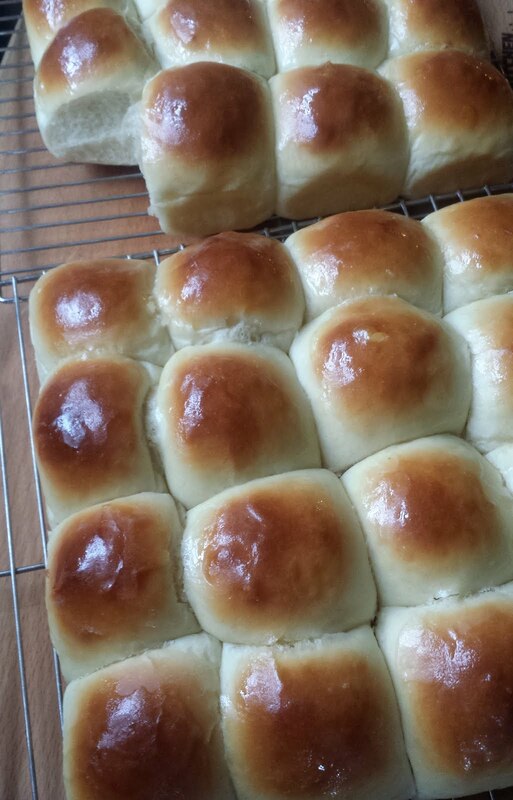 If you prefer cloverleaf or Parker House style rolls, instructions abound in cookbooks and on the internet. As I have looked at—and compared—recipes for soft dinner rolls over the years, I have found that they are generally pretty similar. Most people probably would be able to find such a recipe in their grandmother’s or great grandmother’s recipe collections. The quantities of the ingredients in your family’s recipe might vary a bit from mine…but mostly they are all slightly sweet—and rich with butter, milk and eggs—making them fitting for a special holiday meal. But if you don’t have such a recipe in your family…or a memory of a basket of homemade soft dinner rolls on your family’s table, I hope you will give this recipe a try. And I hope that, like my family, everyone will love them so much that they will ask for them again next year….and the year after that…until they eventually become part of your family’s holiday traditions too. Place the warm water in a large bowl and add the yeast. While the yeast is softening, heat the milk until it is steaming and bubbles are beginning to form around the edge of the pan. Remove the milk from the heat and add the butter. When the butter is melted, add the sugar and salt. Add the warm milk/sugar mixture (if it is hot—over 115°—let it cool a bit before proceeding) to the softened yeast and whisk to combine. Whisk in the eggs. Add 2 cups of the flour whisk until smooth. Gradually stir in enough of the remaining flour to form a soft dough. Turn the dough out onto a lightly floured surface and knead until smooth and elastic (about 10 minutes). Place the dough in a buttered bowl. Turn the dough to coat with butter and cover the bowl with plastic wrap. Let the dough rise until doubled in bulk (about 1 1/2 to 2 hours). When the dough is fully risen, knock it back and place it on a lightly floured surface. 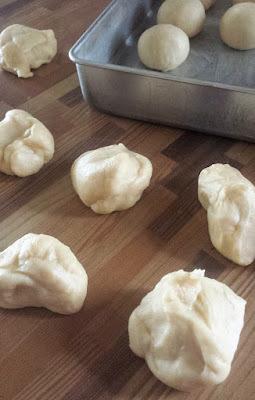 Divide the dough into 32 equal pieces and form into balls. 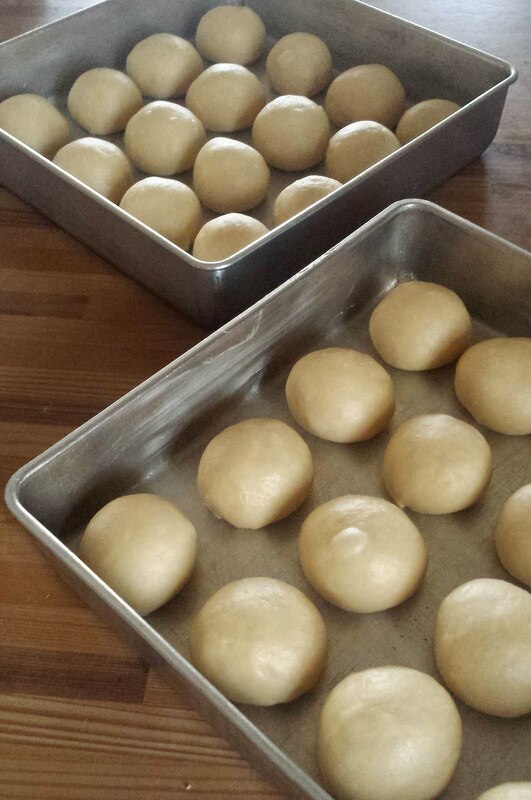 Divide the balls of dough between two buttered 9-inch square baking pans. Cover with plastic wrap and let rise until doubled in bulk (about 45 minutes to an hour). 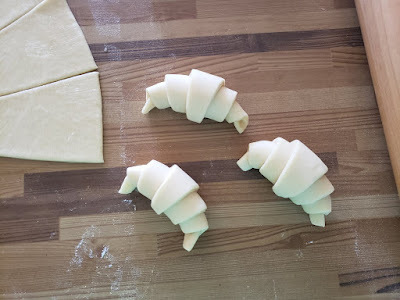 To make crescent rolls, divide the risen dough in half and form two balls. Roll each ball out into a thin 16-inch round. Brush round with some (1 to 1 1/2 T.) melted butter. Cut each round into 16 wedges. Roll each wedge into a crescent, curving slightly and making sure the point is tucked under so the rolls won’t unroll while they rise or bake. Place the rolls 2 inches apart on 2 parchment-lined sheets. Proof & bake. 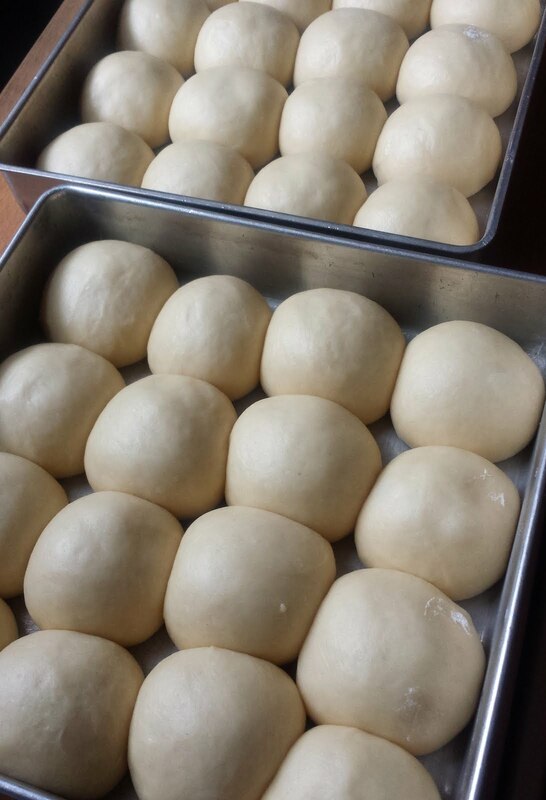 To minimize the work on the day of your gathering, you can make the roll dough the day before. Let the dough rise and punch it down as usual. Form the dough into a ball and return it to the bowl. Cover it with plastic and put it in the fridge for 8 to 12 hours. Take it out of the fridge and proceed as directed in the recipe for forming, proofing/rising and baking. 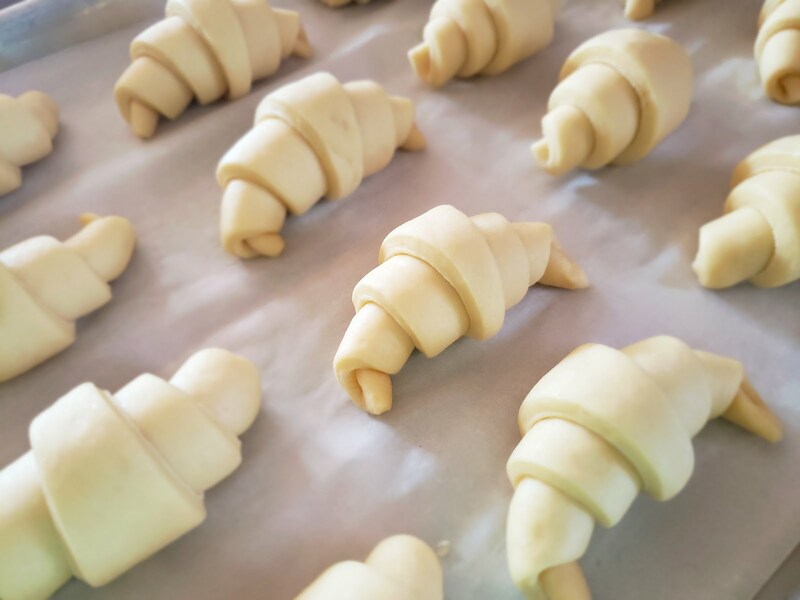 Besides being a time saver, making the dough ahead makes it so that the dough is much easier to handle for rolling and forming into crescents.